Grab your friends and come out for a retreat packed full of fun outdoor adventures for three days. We offer onsite kayaking, mediation hikes, creek wading, aerial yoga, and many more fun optional workshops to help you become more in tune with yourself and nature. All activities are scheduled and can be signed up for upon arrival. The retreat can be tailored to your specific needs, whether it be relaxation on the river or an action packed stay exploring all classes and workshops, you set the pace for your weekend. The camp is located on a riverside peninsula. Camping is available on either riverside property or close to the kitchen and restrooms. Hammock camping is also available for guests who wish to hammock camp. Three communal fire pits are located at different areas of the camp and always available for guest use. Firewood is available for purchase onsite. You are surrounded by the sites and sounds of nature. Currently on one side of the river our neighbor beaver can be working on building his damn, morning birds sing all morning long, and fish are in large supply if fishing is a past time you enjoy. Be sure to bring your bait and equipment and enjoy. Classes are listed and available, but are not mandatory. You are welcome to attend as many or as little as you like. This retreat is all about what is best for your mind, body, and soul. Action packed or relaxation you get whatever you need from it! Check in is daily as this is a continuous two week retreat. Your check in and check out date counts as two of your retreat dates. Itineraries are posted so you know what classes occur each day and you can plan accordingly. If you need to arrive a day early or leave a day late we won't charge you for the extra night of camping, but please be aware that meals or classes on those extra days will be available for a small fee should you choose to take them. 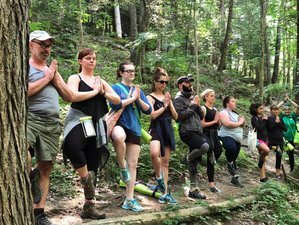 Meditation hike is an excursion that is located 10 minutes from the camp. Dragonfly Outdoor Adventures will transport everyone on their bus. Kristen Matthews (31), RYT-200, Aerial, and Reiki certified. Her goal in teaching yoga is to empower others through the yoga sutras and the physical asanas, to help each person develop a lasting love and discipline for yoga. Her vision is that through the teaching of yoga she can help people become united in a common goal. At first, that goal may be exercise and better health, but she hopes that it would evolve into a passion to make the world around them a little bit better. More kindness, love, compassion, and tolerance will flow out when yoga is a part of your daily routine. 550 Treasure Cove Road, Greenup, Kentucky 41144, USA. Dragonfly Outdoor Adventures is located at the end of a peninsula where the Little Sandy River runs around both their properties. An example of a typical breakfast offered: Fresh fruit, granola, steel cut oatmeal, yogurt, bagels, muffins, occasionally quiche, French toast, etc. An example of dinners we have offered before: Spinach and cheese quesadilla, chips/salsa/sour cream, stuffed mushrooms, vegetable soup/ crusty French bread, black bean burgers/ sweet potato fries, delicious salads w/cranberries, feta, walnuts, vinaigrette, etc. Kayaking is always available to you during your stay, nature walks (we are located 1.5 miles from a lovely nature preserve it is at this location we will do Nature Hike Meditation),3 State parks with lakes are less than 15 miles from us in either direction, Carter Caves is located 42 minutes away is a great place for hiking, caving, and creek wading(state parks and Carter Caves are not included in this retreat, nor is transportation to them). Head northeast on Co Rte 3/1. Continue onto Tri-State airport access road. Turn right onto US-52 N/West Virginia-75 west. Continue to follow West Virginia-75 west. Turn left to merge onto I-64 west toward Ashland. Take exit 179 for KY-67/Industrial Pkwy. Turn left onto Seaton Ave (US23). Turn left onto State RT 3307 (Whetstone Road). Take a slight left onto Treasure Cove Road and follow onto the gravel road to the dead end. The retreat center is located about 45 minutes from this airport. There are car rentals available at this airport and it is a 37-mile drive.